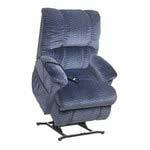 Three position lift chairs are by far the most popular models which operate very similar to the two position lift chairs but will recline farther and elevate the legs higher. 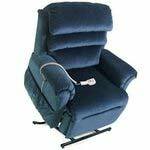 Three position lift chairs are especially popular for people who are unable to sleep in standard beds and many users will spend the whole night sleeping in their lift chair. The new Gentle Line GL-310 lift chair from Pride delivers a contemporary look that compliments any home furnishings, and adds style and sophistication to any room. The new GL-310 life chair features an innovative wooden arm design and sewn pillow back. 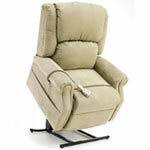 Pride's Casual Line C-15 lift chair delivers great value and excellent comfort with features like an innovative arm design and overstuffed fiber-filled backs. In addition, Casual Line Lift Chairs feature patented quiet and smooth operation and stylish designs to add to any home decor. 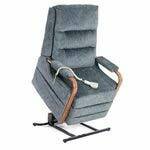 The Pride Gentle Lift Line GL-358 3-position lift chairs offer a great lift chair at an affordable price. The Gentle Line Lift Chairs are available with a full list of standard features like an integrated battery back-up, a heavy-duty motor and actuator, and an extremely durable frame. The LL-450 lift chair from Pride Mobility features removable seat and back cushions, removable chaise pad and a fully padded ottoman. Combined with the contemporary T-Back styling and the result is a chair that is both stylish and comfortable. 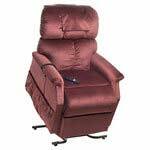 All Pride Luxury Lift Chairs feature plush foam pillow backs with adjustable cushion padding, overstuffed armrests, deluxe fabrics and a ""state-of-the-art"" lift system that will recline you further back than any other recliner, for a relaxing sleeping position. 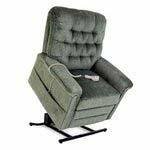 The Pride Luxury Line TMR-585 3-position life chair with the Biscuit Back design provides an attractive and comfortable alternative to more traditional lift chairs. 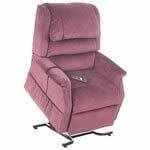 It reclines to a napping position and is available in 11 fabrics and vinyl. Includes whisper quiet operation with it's durable hand control. 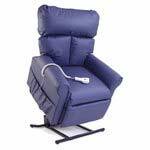 The LL-595 of Pride Mobility's luxury lift chair line is a comfortable 3-position chaise lounger with a contemporary sewn pillow-back design. It is available in four colors including two microsuedes that are sure to complement any decor. 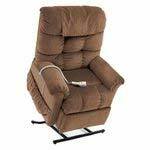 The Golden Tech PR-906 Space Saver3 position life chair is a unique lift/recliner in that it only requires 6"" of recline space from the wall to recliner, yet it still reclines to a napper position. The overstuffed back and arms will invite you to relax for hours of satisfying comfort. Now available in leather, the Pioneer offers a fresh new attitude to lift/recliners. Easy to grasp wooden arms will provide you with more stability while getting in or out of this chair. The seat and back cushions will provide sink in softness for levels of comfort all its own. With a 375 pound weight capacity and choice of small extra wide, medium, large, or tall , this Comforter Series line of 3-Position lift chairs are the perfect choice when comfort is a priority. The full chaise lounge styling offers comfort from head to foot. 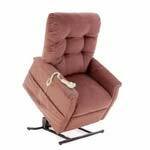 The Golden Tech Royal PR-752 3 position lift chair has a chaise lounge with a waterfall back and sculptured armrests. It provides total comfort from head to toe with chaise lounge padding. 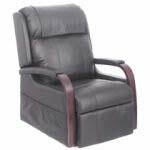 The deep lumbar support and extra thick padding make this a very comfortable and luxurious chair.